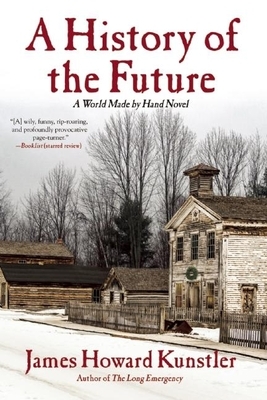 A History of the Future is the third thrilling novel in Kunstler's "World Made By Hand" series, an exploration of family and morality as played out in the small town of Union Grove. Following the catastrophes of the twenty-first century--the pandemics, the environmental disaster, the end of oil, the ensuing chaos--people are doing whatever they can to get by and pursuing a simpler and sometimes happier existence. In little Union Grove in upstate New York, the townspeople are preparing for Christmas. Without the consumerist shopping frenzy that dogged the holidays of the previous age, the season has become a time to focus on family and loved ones. It is a stormy Christmas Eve when Robert Earle's son Daniel arrives back from his two years of sojourning throughout what is left of the United States. He collapses from exhaustion and illness, but as he recovers tells the story of the break-up of the nation into three uneasy independent regions and his journey into the dark heart of the New Foxfire Republic centered in Tennesee and led by the female evangelical despot, Loving Morrow. In the background, Union Grove has been shocked by the Christmas Eve double murder by a young mother, in the throes of illness, of her husband and infant son. Town magistrate Stephen Bullock is in a hanging mood. A History of the Future is attention-grabbing and provocative, but also lyrical, tender, and comic--a vision of a future of America that is becoming more and more convincing and perhaps even desirable with each passing day. James Howard Kunstler was born in New York City in 1948. He is the author of twelve novels, including "World Made By Hand" and "The Witch of Hebron," and four nonfiction books, including "The Long Emergency." He is a frequent lecturer at colleges and professional organizations across the country. He lives in Saratoga Springs, New York.